The first movement, Cut it Right There, is a reference to the famous Lennon story of the editing of “She’s so Heavy”. Upon hearing the perfect moment to end the song, Lennon instructed the engineer to “cut it [the tape] right there”, which is exactly what we hear on Abbey Road. The movement explores one of the great influences on Abbey Road, Beethoven’s Moonlight Sonata. The second movement, The Play You Are Staging, is a slowly evolving song over a chord sequence borrowed from George Harrison’s “While My Guitar Gently Weeps”. A constant quarter note accompaniment in the piano underpins the evermore elaborate melody in the tuba. The final movement, That Magic Feeling, uses the iconic chords of “You Never Give Me Your Money” as a starting point. Quirky in nature, the finale represents the fun nature of the Fab Four, and is a tour de force for both tuba and piano. 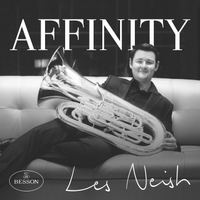 One Sweet Dream is dedicated to Les Neish who, along with an international consortium of tubists, commissioned the work.